Hawaiian Style Weddings include the traditional practices of blowing of the pu, or conch shell, exchanging fresh flower leis and a Hawaiian chant or prayer in Hawaiian wedding ceremonies. Blowing the conch is much like singing in that everyone sings differently. People really like the way it sounds. Most Hawaiian Style Weddings, Vow Renewals and Civil Union weddings begin with the traditional trumpet call when the kahu (pastor or minister) lifts a large ceremonial conch seashell, the pu, and blows a proclaiming tone. Used in both religious and secular purposes in Hawaiian tradition, the pu signals that something special is about to happen, royalty is approaching, or the spirits are being called together. For weddings, the pu is blown to open and close the ceremony. Blown by both male and female kahu, the pu produces a grand, deeply rounded tone that spirals for miles over the sounds of the waves, mixing with the wind and penetrating the clapping of the palm fronds. The conch seashell is a large, marine gastropod mollusk with over 100,000 known species. 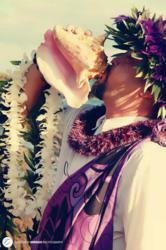 The large shells used by officiants at Hawaiian Style Weddings come from both Pacific and Caribbean waters. The Cassis Cornuta, or Helmet Shell, found in the coral sands of the Pacific sports a stouter spire and is a favorite among the ceremonial trumpeters. The elongated, Pacific Triton pu produces a deep resonating sound and is considered a rare treasure by Hawaiian celebrants. With a translucent glassy pink or orange glow, the Caribbean Queen Conch Shell is a prized ceremonial pu for opening luaus, weddings, birthdays, festivals, funerals, processionals, and any other formal gathering. "We work with each couple to produce customized and meaningful weddings on Maui, Oahu, Kauai, and on Hawaii, Hawaii," said Jana Rothenberg, wedding planner and consultant at the full-service Hawaiian Style Weddings. "Our wedding packages all include Hawaiian prayers, blowing of the pu, and the traditional exchange of the flower lei." She continued, “Couples from around the world request traditional practices performed in their Hawaiian beach weddings whether for religious, non-religious, or spiritual ceremonies. Our ceremonies joyfully begin with the blowing of the pu." Some officiants prefer the larger Triton species that takes a fuller push of air to spiral through the whorl of the shell. On Kauai, Kahu Harold Kilborn's shell of choice is from Malaysian waters. Kilborn precedes every wedding with a resounding pu solo blown into four directions. Kilborn has perfected his two-tone sounds over more than forty years, saying, "It takes strong, healthy lungs to produce the two tones. The deep sounds come fairly easily, but the higher tones mean I tighten my lips against the shell and blow straight from my diaphragm with a breath from a powerful place within." Mark Steffan, owner of Maui'd Forever Weddings explains, "Our couples want the sound of aloha that blowing of the pu represents. The bride knows that is her call to advance across the beach towards her awaiting groom, heralding the beginning of the wedding." Likewise, Kilborn culminates the ceremony with a rich, duel-tone staccato "whaaaa-hoot!" signifying the end of the wedding ceremony and the beginning of the couple's marriage and life together. It is in perfecting the style that the kahu finds his or her own unique "sound". Kahu Kimo (James) Kirkman, one of Hawaiian Style Wedding's officiants on Maui, officiates his weddings wearing the traditional haku lei, a garland, around his head, and a kihei, a traditional drape, around his shoulders. He blows the colorful conch shell that he bought on a visit to the Caribbean island of Antigua. Back on Maui, Kirkman, under Kahu Laki Kaahumanu's excellent mentoring, perfected his particular technique for months before including the pu into his Hawaiian ceremonies. Kirkman ground the shell's spire into a custom fitted mouthpiece to produce the harmonic he wanted. "Each shell has different tones, and each player produces a different sound," Kirkman noted. "Blowing the conch is much like singing in that everyone sings differently. People really like the way it sounds."